I am so excited about hosting Lauren Spieller today as part of the Your Destination is on the Left blog tour! Even though this is her debut novel, Lauren is no stranger to the book community as she is also a literary agent. So without further ado, let’s dive into the interview! How much research was involved while writing Your Destination is on the Left? I did a fair amount, considering it’s a contemporary realistic novel! Dessa’s story takes place partly in an RV, and while I had been inside one before, I’d never traveled that way. So I had to learn a lot about RV life—what it’s like to live inside one, where you’re allowed to park and how to upkeep the RV itself, etc. I also had to research what it’s like to be a visual artist, since I myself don’t paint or create found art, both of which Dessa does in the book! For that, I relief on a combination of online and in person research, and asked my artistic friends a million questions (shout out to Roselle Kaes, who is amazing!). It truly took a village, in the end. What was the most surprising thing about RV/nomadic life that you came across while researching? This might sound silly, but I had no idea you have to dispose of your own…waste products…when you park the RV. But it makes sense when you think about it—you’re traveling in a mobile house, so the waste has to go somewhere! Are there any destinations you would love to take a road-trip to? Oh gosh, a million. I’d love to see Montana, which is apparently gorgeous, and I’d also like to drive across Canada! You’re both an author and a literary agent—what’s it like to be on both sides of publishing? It’s wonderful….and busy! I have to schedule my time very carefully so that I can write my own books, read submissions, and edit client manuscripts (often all three in a single day! ), but I wouldn’t change it for the world. I feel incredibly lucky that I get to do both jobs. It’s very fulfilling. For all the writers out there, what’s one piece of writing advice that you would share with them? Surround yourself with people who are supportive of you and your work. Publishing is a hard business, so it’s important to have a good support system to cheer you on when things are going well, and lift you up when times are tough. Before we go, what can you tell us about your next novel, She’s the Worst? Yes! She’s the Worstis about two sisters spending one last day together before the older sister goes to college, but when secrets come out, they have to decide if their relationship is going to continue…or fall apart. We pitched it as 10 Things I Hate About You meets Ferris Bueller’s Day Off, by way of Morgan Matson. I’m really excited about it, and would love if readers would add it to their TBR lists on Goodreads! Lauren Spieller is a literary agent who lives in New York with her husband. When she isn’t writing, she can be found drinking lattes, pining for every dog she sees, or visiting her native California. 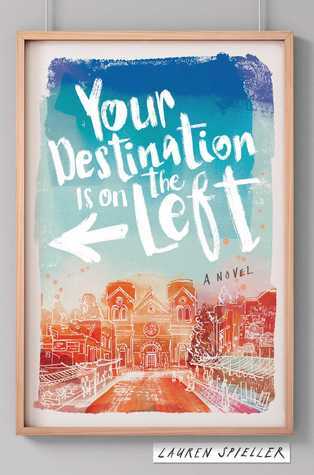 YOUR DESTINATION IS ON THE LEFT is her debut novel. “What do you think about YOUR DESTINATION IS ON THE LEFT? Will you be adding it to your TBR?” I love to read about modern-day nomads! I have put it on my TBR! Yay! I hope you enjoy the book!